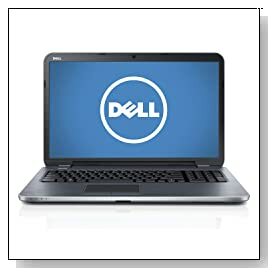 Moon silver Dell Inspiron 17R i17RM-5162sLV is an attractive 17.3 inch notebook with a 4th generation Intel Core i5 processor which will work brilliantly on almost all your daily tasks and it is slimmer and less heavy as compared to earlier generation Dell notebooks. On the whole, this Dell is a great laptop at an affordable price. Intel Core i5-4200U at 1.6 GHz, being a Haswell processor, provides lengthy battery life and excellent general performance with power and swiftness using Windows 8 operating system. Both the 8 GB (2x4GB) DDR3L SDRAM at 1600 MHz and the Western Digital 1 TB 5400 RPM SATA hard drive are really generous and spacious for multitasking, easy and consistent functioning of everything plus for saving all of your multimedia files. The large 17.3 inch HD+ LED backlit Truelife display with Intel HD Graphics 4400 at 1600 x 900 pixel resolution.. As soon as you start up the Dell Inspiron you will observe immediately the clear pictures it can show. The screen is a large 17.3 inch so it will give you a desktop feel for whatever you do. You will also get top quality sound through integrated speakers and Waves MaxxAudio 4.0 with clear highs and pleasantly mild lows, offering you complete control over sound. You have the spill resistance feature on its comfortable full keyboard with a 10-key numeric keypad. 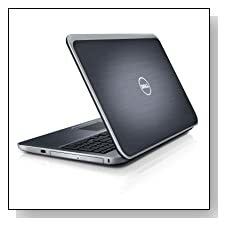 Keys and the touchpad clicks are equally dependable as Dell tests them both for millions of times of use and no failure. Brushed-aluminum texture and curved corners moon silver Dell Inspiron has a 65WHr 6-cell Lithium ion battery with a reasonable battery life due to its fourth generation Haswell processor. It is not the lightest at about 7 pound weight- being a 17.3 inch screen laptop but around 1 inch thin. Some of its connectivity options include 802.11bgn wireless, 2 x USB 2.0 Ports, 2 x USB 3.0 Ports, Tray load Optical DVD Drive, HDMI port, 8-in-1 media card reader, RJ45 Ethernet port and Bluetooth tied to wireless card. Conclusion: 17.3 inch Dell Inspiron 17R i17RM-5162sLV is a fine laptop with a nice price tag. Although not very light, still less heavy and slimmer than earlier models of the Dell Inspiron. It works fast for most of your tasks but we haven't tested it for the newest advanced games. If you are looking for a desktop replacement that is solid and robust to prepare your assignments, browse the net, listen to music and watch movies on a big screen, then it may well be the one for you.